Giving the Best.Gift.Ever has no age limit! Just ask six-year-old Lily from Newfoundland. She comes from multiple generations of Canadian Feed The Children donors, and is carrying on the tradition this year with her gift of chickens from the Best.Gift.Ever catalogue. Lily holds her certificate featuring Huck, Duck and Chuck. 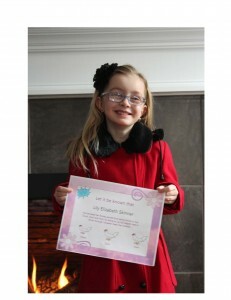 It all began when Lily asked if she could do chores to raise money. She helped out around the house by setting the table for dinner, vacuuming, and tidying her room. When she had raised enough, she told her grandmother (whom she calls ‘Nana’) – a long-time CFTC supporter herself – that she wanted to buy chickens for charity from CFTC’s Best.Gift.Ever catalogue. Her Nana helped her make the donation, and Lily promptly named her chickens Huck, Duck and Chuck. Lily understands that the chickens will go to a family in a developing country, where they will help give children just like her good nutrition, plus give their moms and grandmas a source of income to care for their children. “I think it’s important for children today to appreciate that not everyone is as fortunate as them,” Wendy added. Lily’s story is one of many that touch our hearts this time of year, and CFTC thanks Lily, her mom and her grandmother, and all of our supporters for their continued efforts to help create a world where children thrive free of poverty.